HÀ NỘI – Representatives from Spanish energy company Repsol on Tuesday met with leaders of the Bình Sơn Refinery and Petrochemical Co Ltd (BSR) to seek opportunities to invest in the Dung Quất Refinery. During the meet, Repsol said the company not only wants to own shares of Dung Quất Refinery, but also wants to participate in the plant’s management, operation and trade. 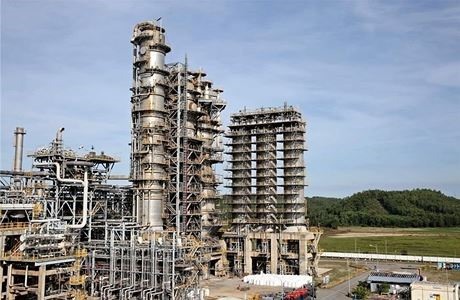 Leaders of BSR, which operates the Dung Quất Refinery, agreed with Repsol’s proposal to set up two negotiating teams to further discuss co-operation between the two sides early. Dung Quất Refinery, which holds one-third of the petroleum market share in Việt Nam, plans to sell 4-6 per cent of its stake in January next year. Following the IPO, the Ministry of Industry and Trade (MoIT) plans to continue transferring 49 per cent stake to strategic shareholders in 2018, which means the State’s ownership ratio in Dung Quất will be lower than 50 per cent. This will allow private investors to control the No.1 oil refinery in Việt Nam. Under the current law, foreign investors are not allowed to distribute petrol products in Việt Nam, unless they have oil refineries in the country. Therefore, analysts predict foreign conglomerates will buy stake in Việt Nam’s oil refinery to obtain the right to distribute petrol products. The Vietnamese energy market is witnessing the highest growth rates in the region. The total demand for petroleum products in Việt Nam in 2015 was 17.5 million cu.m. According to the World Bank, average petroleum consumption per capita in Việt Nam has increased by 5 per cent per year. The demand mostly comes from three sectors – transport (65 per cent), industrial production (20 per cent) and people’s consumption. Dung Quất’s business performance is impressive. It posted revenue of VNĐ74 trillion and net profit of VNĐ4.492 trillion last year, which means a rate of return on equity (ROE) of 14 per cent.